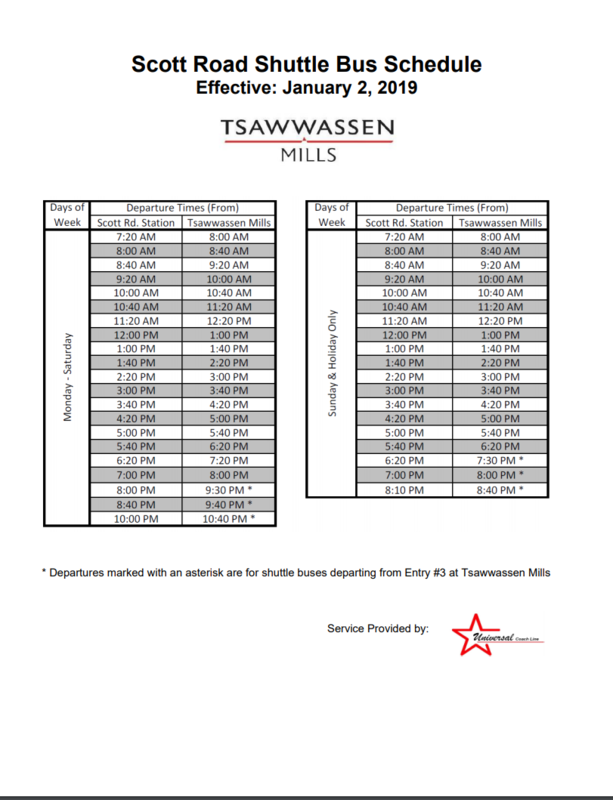 We are pleased to provide two employee shuttles for Tsawwassen Mills. The route from Scott Road Station (110th Ave.) to Tsawwassen Mills and the route from Kwantlen Polytechnic University (KPU) to Tsawwassen Mills supplements existing public transportation routes to Tsawwassen Mills (601, 609, 620). Tickets available in a 2 pack for $4.25 (tax included), 10 pack for $21 (tax included) or a monthly unlimited pass for $42 (tax included). The service consists of two 29 passenger shuttle buses, operated by Universal Coach Line. Tickets and Monthly Passes can be purchased at Guest Services. Frequency of the service is approximately every 40 minutesexcept two breaks. 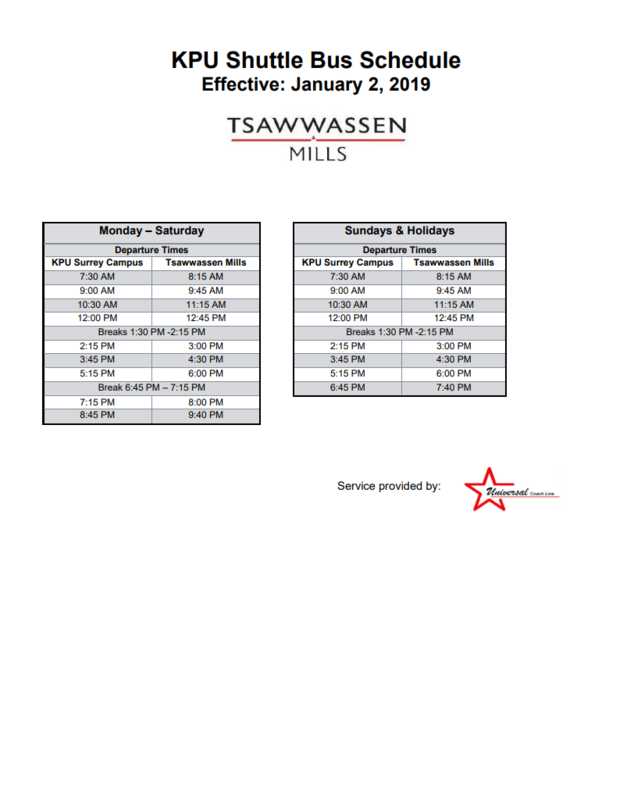 Click here to download the schedule and detailed departure times from Scott Road Station (110th Avenue) to Tsawwassen Mills, effective January 2, 2019. Bus stop on Salish Sea Drive by Entry 3. This additional route from KPU in Surrey on 72nd Avenue at 126th Street increases accessibility from a key, central Surrey location with connections to public transit. Tickets are available in a 2 pack for $4.25 (tax included), 10 pack for $21 (tax included) or a monthly unlimited pass for $42 (tax included). Tickets can be purchased at Guest Services. The service consists of one 29 passenger shuttle bus circulating on a 45 minute schedule each way between KPU and Entry 3 of Tsawwassen Mills.